This painting speaks to the theme of unifying opposing ideas and concepts. Through the process of convergence, we see that the whole can be greater than the sum of the parts. In this painting, Ralph White sought to expand the concept of the spiritual journey beyond the individual to the communal. 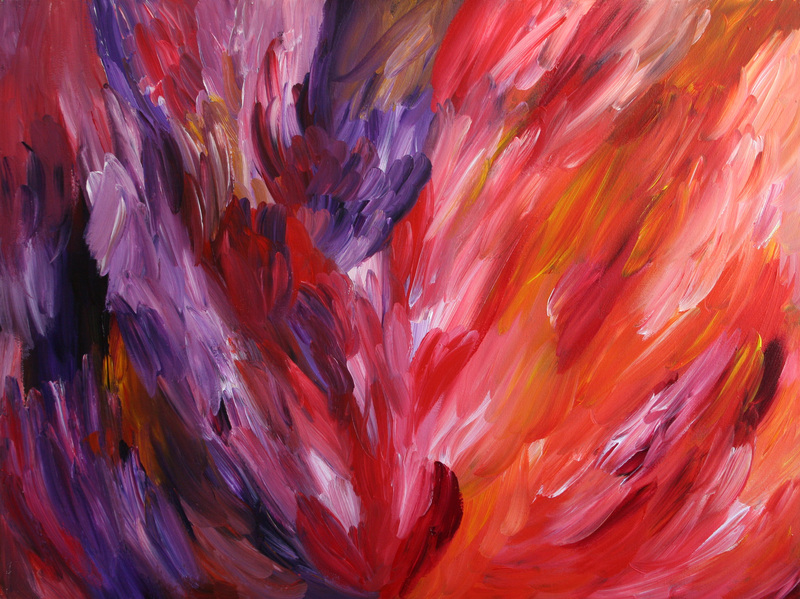 Convergence displays a lovely color palette that blends reds, purples and oranges in a harmonious tableau. The colors work together and complement each other. There is a demarcation, however, right down the center of the painting. Careful study reveals that while reds are found on both sides of the painting, purples are relegated to the left and oranges to the right. There are two different forces at work here, both relevant and vital, yet distinctly opposed. How often in life are we faced with this sort of dichotomy? While we are faithful to our beliefs, we must also find ways to work together to remain productive and not dysfunctional. In this painting, White suggests that divergent beings can remain authentic while blending together to create combined beauty. The trick is in being able to acknowledge and affirm the relevance of each person’s intention. If intentions are honorable, then cooperation can occur.